PayPal provides buyers a safer and quicker way to pay for goods and services. With your PayPal business account, you can now accept more forms of payment, wherever you do business. This page explains how to use your PayPal account to manage your PayPal transactions, withdraw funds and tips to managing customer enquiries. 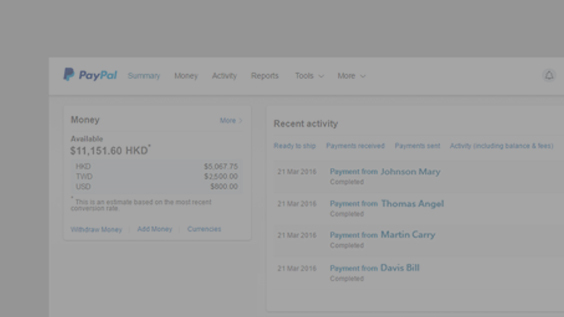 In your account you can view your most recent transactions on the first page. Simply click on a transaction to view more detail. To view older transactions, click on the Activity tab to view transactions for the past month, quarter or year, or define a custom period. You can also filter transactions by type or currency. You can also view monthly statements and use the Charts & Graphs function to track your business growth. To export transactions, click Download. Once you have started receiving PayPal payments you can use the funds to shop with PayPal or withdraw them to your bank account. If you haven’t already linked a bank account, you’ll need to do that first. You can withdraw locally denominated funds to your banks in Hong Kong and it’s free for $1,000 HKD or more. If you have a bank account in the US, there is a 2.5% fee to withdraw US denominated funds to banks in the US. It normally takes 3 - 6 business days for the funds to appear in your banks. 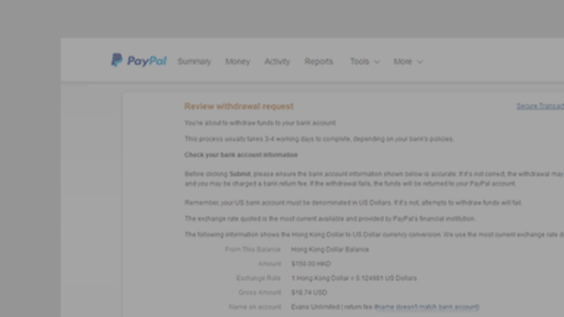 To withdraw funds, log in to your PayPal account and click on the Money tab, then Withdraw balance. Click on Withdraw funds to your bank account, and then enter the amount you wish to withdraw and select which of your bank accounts you would like to transfer the money to (if you have added more than one) and click Continue. Check your withdrawal information and click Submit. If you have technical expertise and experience in API programming, or you have a developer who does, you can customise your PayPal integration. Our Developer Centre provides integration guides, information about our APIs and instructions for completing test transactions. You can select when to receive email notifications from PayPal. For example when you receive money, send money or when a secondary users makes changes to your account. It’s easy to issue full or partial refunds of transactions in your PayPal account. You can issue a refund up to 60 days after a transaction. Make sure the business name that appears on your customer’s card statement accurately reflects your business. This is particularly important if you operate under a trading name that’s different to your PayPal account name. The Resolution Centre is used as a central place for you to communicate with your buyers if they raise a claim or dispute on a transaction. 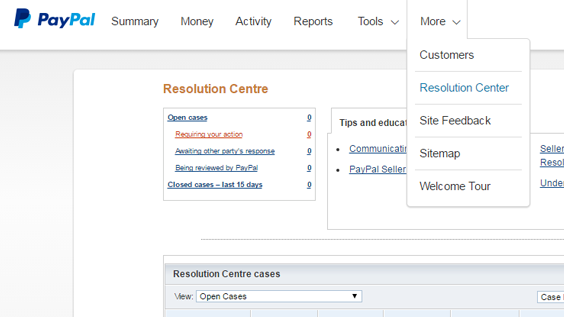 To access the Resolution Centre, log in to your account, click on More tab and Resolution Centre.